Hombro a Hombro’s medical mission focuses on low-cost care to provide the maximum benefit to the most people possible. However, sometimes we encounter individual cases that although complicated, can be resolved with a simple surgery or treatment. Over the years, our staff and volunteers have met and helped several patients with more complicated medical problems. Honduras generally provides free or heavily-subsidized healthcare. It does not, however, provide for food, lodging, medications, or transportation for patients or their families. Regular supply shortages also mean that patients must provide gloves, sutures, and other basic supplies to physicians. Our Alto Riesgo (High Risk) fund provides families with this funding so they can receive the care they need. Unfortunately, there have been instances in the past where patients or their families have been unable or unwilling to complete treatment. Therefore, our medical team identifies and selects each recipient based on their need, their medical condition, and their ability to complete the necessary treatment. In the past, Hombro a Hombro has provided alimentos (nutrition, milk, supplements) to families with malnourished children. We have paid for weekly casts for infants born with clubbed feet. We also regularly provide for the cost of transportation for patients to visit the nearest specialist clinics, which are often several hours away in El Salvador or Tegucigalpa. Young Bryan was born with clubbed feet. Without intervention, Bryan would eventually learn to walk on the clubbed feet, breaking down his ankles, causing scar tissue and arthritis to cripple him. He would eventually lose the ability to move on the feet and require amputation. At the Santa Lucia clinic, Dr. Rubén Martínez is able to correct club foot deformities. With weekly castings over the course of the child’s first year, Bryan’s feet slowly turned in the right direction. After the castings were complete, he was fitted with special shoes to sleep in during the night. At four years old, Bryan runs and plays with the other children with no visible difference in his gait. As a little girl, Heydy dropped boiling water on her leg and badly burning her foot. As she grew, the tendons and ligaments in her foot and leg tightened due to her burned foot. After four years, she sought help at the Shoulder to Shoulder clinic. We paid for her expenses to receive surgery in Tegucigalpa. The surgery reconstructed her ligaments and tendons, allowing her leg and foot to grow normally. Aside from surgical scarring, today Heydy is a happy and healthy young lady. Edwin Josue was born with a cleft pallet. 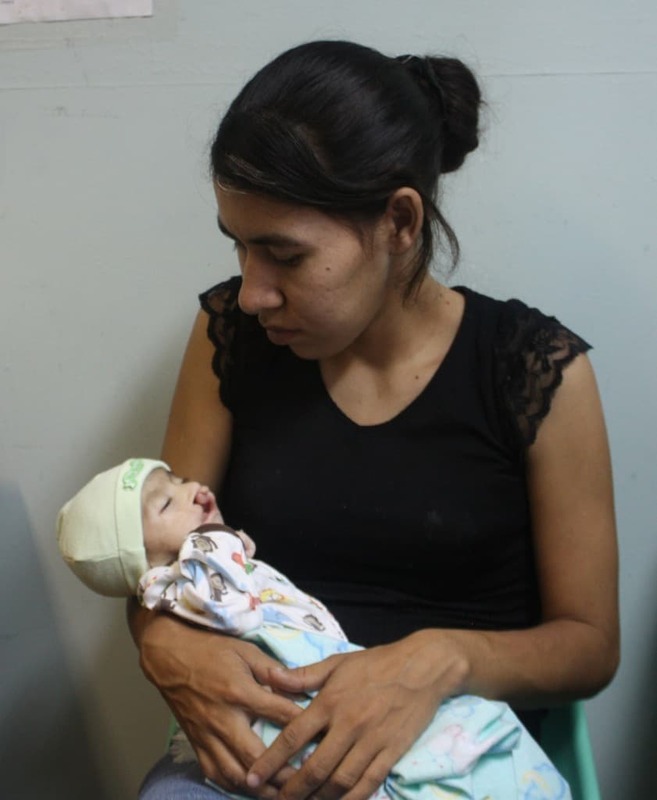 He is unable to nurse, and can only receive nutrition when his mother places droplets of milk and formula into his mouth. At three months old, he is weighs only 5.5 pounds. Edwin is severely undernourished and at risk of dying from malnutrition. Working in partnership with Operation Smile, we sent him to a surgical brigade in Santa Rosa de Copán, over ten hours from his home. There, he will receive care and nutrition. Once he reaches a healthy weight, he will return for life-altering cleft pallet surgery. Doña Julia and her family are a lesson in perseverance. Her husband is blind, but each day he walks to the nearby river where he collects sand to sell to construction sites. Doña Julia is developmentally delayed. The family lost two of their sons, including the teenager in the photo, to congestive heart failure arising from untreated childhood diseases. Despite these challenges and tragedies, the family pushes forward. Recently, Doña Julia gave birth to triplets. Their low resources prevent them from properly caring for the new additions, and they sought assistance from Shoulder to Shoulder. With generous contributions by our Honduran staff, Dr. Christy O’Dea, and the Westendorf family, we helped the family rebuild their three-walled living space into a cement home that is protected from the elements and harmful pests such as Chagas. We also assisted the family with formula for the triplets for their first year. In exchange, Doña Julia promised to send all of her children to school. Because Hondurans can access free or nearly-free healthcare, patients only require assistance for medications or logistical expenses. In many cases, we can provide the medications, transportation, lodging, and food to receive necessary treatment for under $250 US. If you are interested in learning about current Alto Riesgo patients, please contact us.